Looking for hotels near Fortica Fortress? 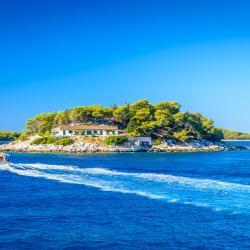 Set in Hvar, Villa Malisko provides free WiFi, 1.4 km from Stipanska Beach. Providing a garden and a terrace, Mimi is located in the Hvar Old Town of Hvar, not far from St. Stephen's Cathedral in Hvar. Free WiFi is offered. Located just steps away from St. Stephen's Square in Hvar, History Hvar Design Apartments is set in Hvar and offers air-conditioned accommodation with city views. Free WiFi is available. Located in the very centre of Hvar, about 50 metres from the main square, Guesthouse Kampanel is a traditional Dalmatian stone house, fully refurbished in 2014. 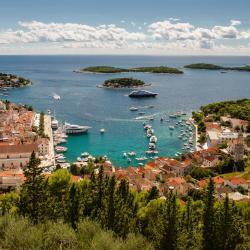 Set in Hvar, Kampanel 10 provides accommodation with free WiFi, seating area and flat-screen TV. Each unit is fitted with air conditioning, a private bathroom and a kitchen. 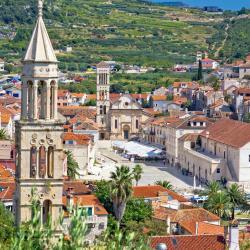 Located in the heart of Hvar, Villa Nora is housed in a former palace from the 14th century. It offers spacious rooms with air conditioning, minibars and satellite TV. Situated in a secluded pine grove and completely renovated in 2016, the modern Pharos Hvar Bayhill Hotel offers brightly furnished rooms, an outdoor swimming pool and bar area, as well as a modern... Very interesting modern hotel. Realy great and helpful staff. Nice breakfast. Located in a quiet and secluded bay with a private beach surrounded by palms and pine trees, Hotel Podstine features a diving centre, a spa & wellness centre and an outdoor pool. The staff were so knowledgable, helpful and accommodating. Located just 50 metres away from the beach, Aparthotel Pharia offers modern and stylish rooms with views of the Adriatic Sea or the surrounding fields and olive trees. Location is lovely, staff are friendly. Located just 30 metres from the beach in Hvar, Hotel Croatia provides free Wi-Fi and satellite TV in its air-conditioned rooms. Perfectly located in Hvar in a very nice villa from the 30s. Located on the waterfront promenade of Hvar and boasting marvellous sea views, Delfin Hvar Hotel offers rooms with park or sea views. The staff were so friendly and helpful, the full continental breakfast was lovely. Well worth the 40kn they charge for you to take in that view! Well worth the 40kn they charge for you to take in that view! Would recommend around sunset very beautiful. Don't underestimate the climb though takes a good 15/20 minutes and is quite steep at points.